After the worst Christmas Eve trading session ever, U.S. equities are doing their best to put on their Santa caps and get a rally going. We’re seeing a significant bounce in the indices and investors are wondering how long this bounce can last. Instead of the indices though, let’s take a special look at FAANG for our top stock trades for tomorrow. Despite a bevy of negative news, shares of Facebook (NASDAQ:FB) were doing relatively well. At least, compared to the rest of the market. In fact, the stock is outperforming the rest of its FAANG peers so far this month and is the second-best performer this quarter. Bet you wouldn’t have guessed that, but now what? Shares are currently below the 200-week moving average and remain trapped in a tough downtrend. 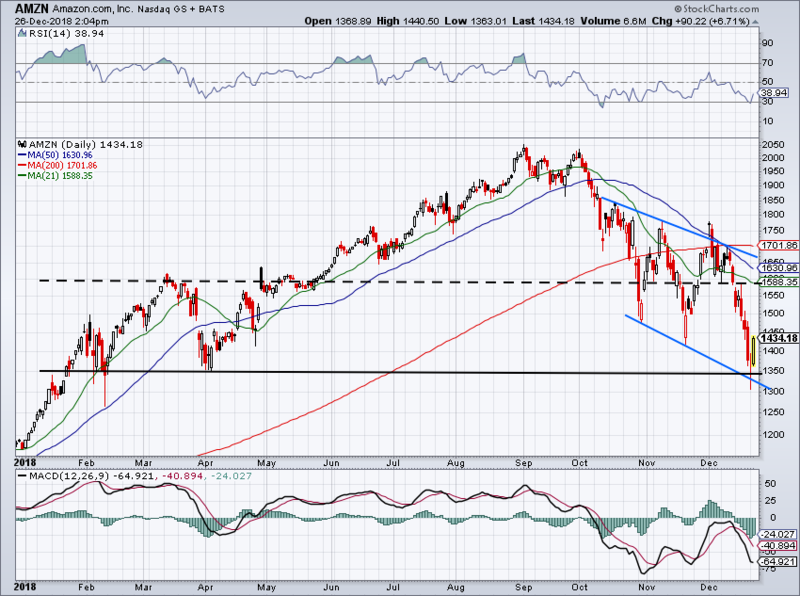 First thing’s first, FB need to break the downtrend and hopefully get back over the 200-week moving average. If it does, it may be able to work up the strength to test the $150 level, the spring lows during the Cambridge Analytica scandal. Below this week’s lows and FB’s price action can get ugly. Amazon (NASDAQ:AMZN) has had a rough go of it, but our previous $1,350 target from earlier this month is showing hopes of holding. The stock did overshoot that level by a bit, but is bouncing nicely on Wednesday, up almost $100 per share. We could see Amazon add another $100 to $200 per share depending on how strong of a bounce we can get here. But keep in mind, while a bounce may feel nice, there are countless levels of resistance overhead. Don’t hesitate to take profits if we near some of these marks, particularly over $1,550. 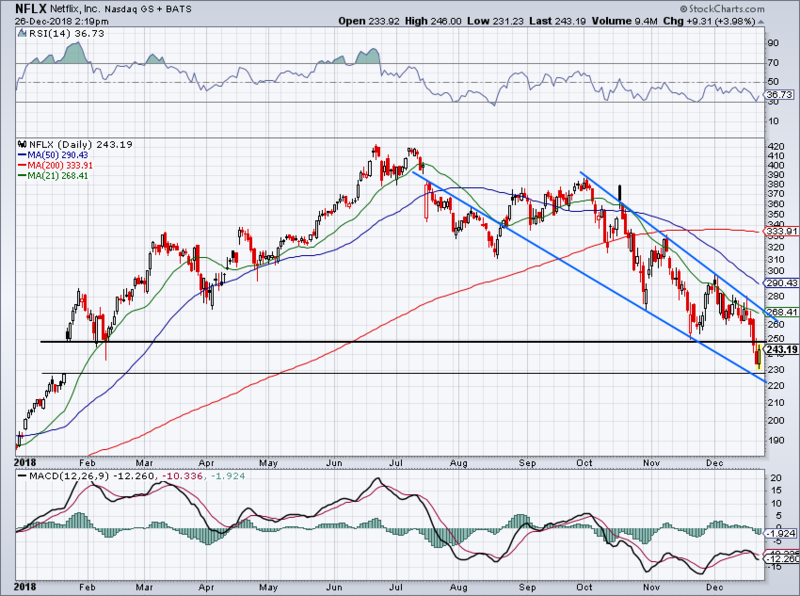 At its lows, Apple (NASDAQ:AAPL) was down more than $85 per share from its high at the beginning of the fourth quarter. That’s a more than 36% beating in one of the world’s most successful companies. You better believe Apple and Warren Buffett are in there buying with both hands. Should you? Honestly, I would have loved for a test of $140 and the 200-week moving average, but if we’re going to rally, sub-$150 isn’t bad either. The stock’s cheap, growth is good and the balance sheet is made of kevlar. 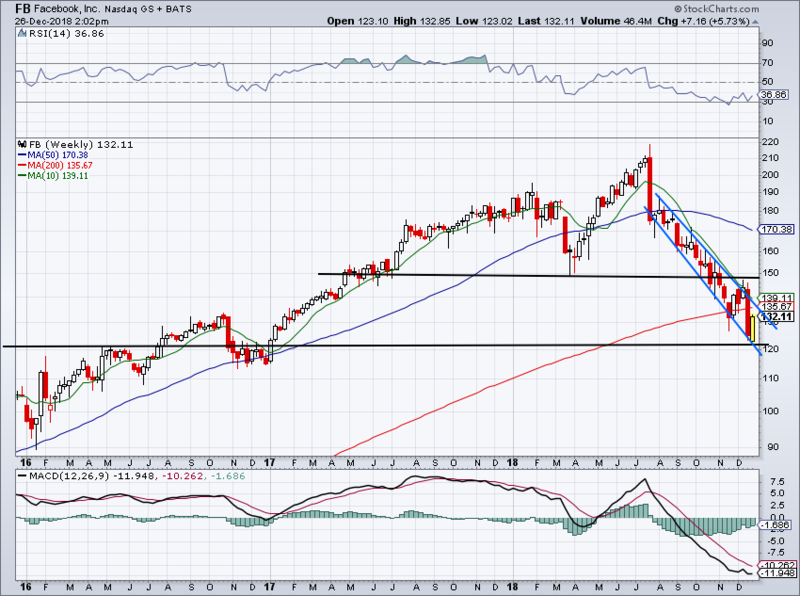 Down 11 of 12 weeks entering this week and Apple is oversold, plain and simple. I’m a buyer. 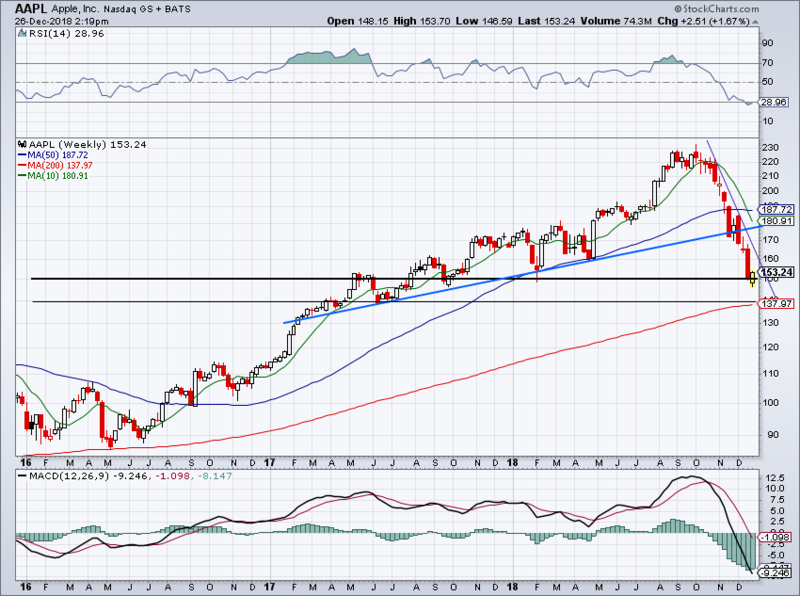 We recently looked at a short entry in Netflix (NASDAQ:NFLX) and said a break of $250 was bad news. That has panned out pretty well, with NFLX all but filling the gap from January. Not many bulls would have predicted that in June. But man, I really wish it would have officially filled the gap just under $230. I would feel better about the name going forward if it did. Alas, it didn’t and now we’ll have to see what kind of bounce we get. So far, shares are still trapped in a relentless downtrend. We’ll need to see that give way for any sustainable upside to occur. Just getting there though is a $20 to $30 per share rally. Not bad. Last but not least, the company formerly known as Google and now known as Alphabet (NASDAQ:GOOGL, NASDAQ:GOOG) rounds out the FAANG group. As we’ve pointed out 1,000 times before here on InvestorPlace, the $1,000 mark on GOOGL remains critical. Breaking below this level for any sustainable amount of time spells trouble and could easily send Alphabet down another 5% to 10%. So far though, it’s holding up. That’s likely as investors find GOOGL to be a value play and relish its rock-solid balance sheet. 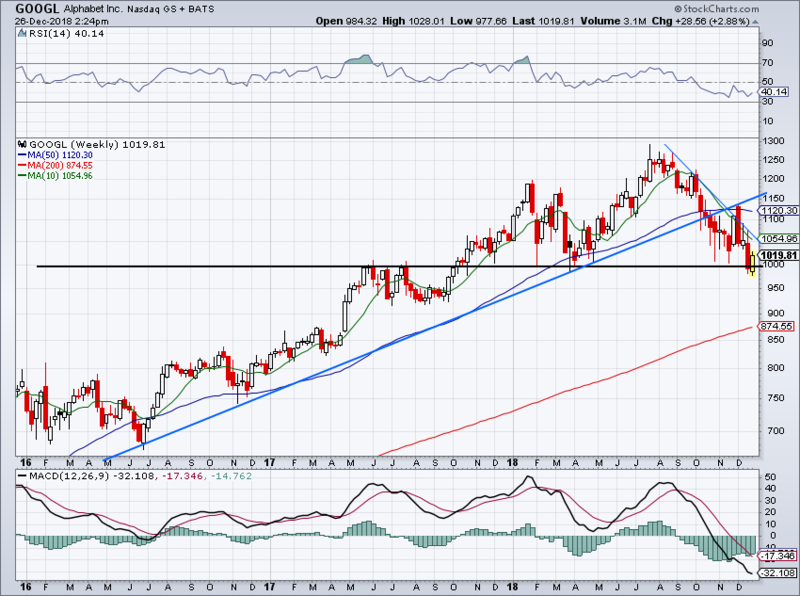 The stock broke down below uptrend support (blue line) in October and failed on a retest back in November. Since then, it’s been caught in a tough downtrend. If $1,000 can hold it up, perhaps GOOGL stock can break over downtrend resistance and start to chip away at some of its bearish momentum. If it can’t, maybe we’ll get a longer shot at GOOGL in the triple digits. When the market eventually bottoms, Alphabet will be a go-to name, whatever price that may be at. Bret Kenwell is the manager and author of Future Blue Chips and is on Twitter @BretKenwell. As of this writing, Bret Kenwell is long AMZN, AAPL and GOOGL. Article printed from InvestorPlace Media, https://investorplace.com/2018/12/5-top-stock-trades-for-thursday-trading-faang/.